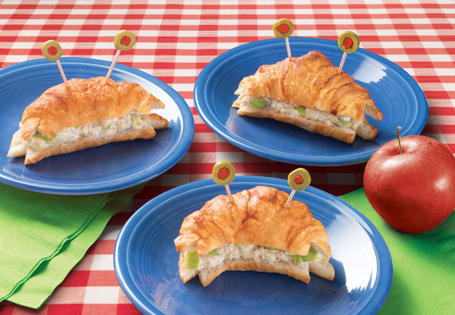 Kids will love to eat tuna salad in the shape of a crab. In a small bowl, melt butter and tomato paste in microwave, about 1 minute, stirring every 30 seconds. Brush onto croissants and bake for 6 minutes. Set aside. In a medium bowl, combine tuna, apple, mayonnaise, relish, salt and pepper. Slice croissants in half and evenly distribute the tuna salad among the croissants. In the ends of each croissant, cut out a "V" to resemble claws. Place the olive halves on top of the croissants for eyes. Adhere with toothpicks.